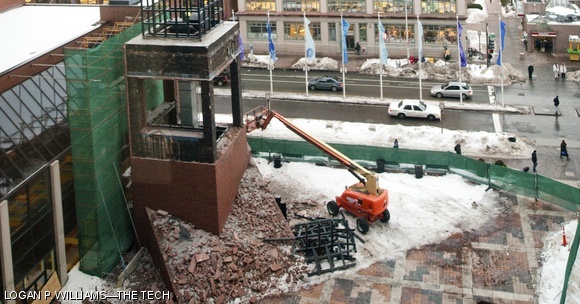 Adjacent to the MIT Coop, the courtyard by the Kendall Marriott is being renovated this winter by the owner of 3 Cambridge Center, Boston Properties. The existing plaza will be demolished, new drainage and waterproofing will be added, and it will be re-paved and landscaped. The courtyard is seen from above, looking towards Building E38 (MIT Press).